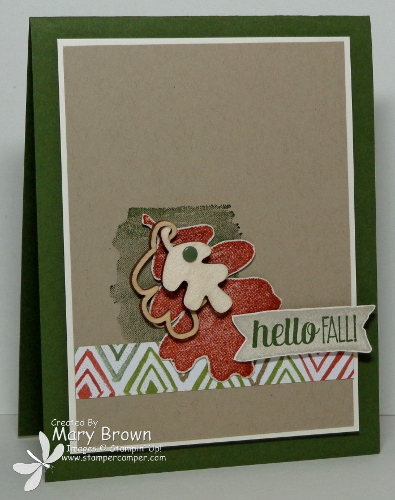 Oh my word…it’s Day 5 of Preview Week for Create with Connie and Mary Holiday Card “Create”tions! That means you can meet two more of our fabulous design team members AND you have the opportunity for TWO BLOG CANDY!!! We just love doing things in TWOS!!! Remember to find out who it is, head over to Create with Connie and Mary! So this is the third card I made with the For All things set just for Preview Week. I kept the colors pretty similar to my other ones but did change it up a bit. Stamp the leaf using Cajun Craze on Very Vanilla and cut out and add to card front. Stamp banner using Sahara Sand on Very Vanilla, stamp greeting using Mossy Meadow. Cut out and add using dimensionals. Add Always Artichoke Candy Dot to the solid wooden leaf to finish it off. Tomorrow is it…the LAST DAY for Preview Week! 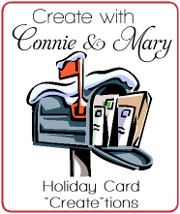 Create with Connie and Mary Holiday Card “Create”tions starts Sunday! This time we are doing an ALL CARD collection…how cool is that??? Don’t forget to head on over to Create with Connie and Mary and see who is offering BLOG CANDY today! This entry was posted in Create with Connie and Mary, Holiday Mini and tagged For All Things. Bookmark the permalink.